Can Your Known Fraud Tools Fight Unknown Fraud? The digital economy is witnessing sophisticated and previously unknown fraud attacks like never before and existing fraud solutions are struggling to keep up. 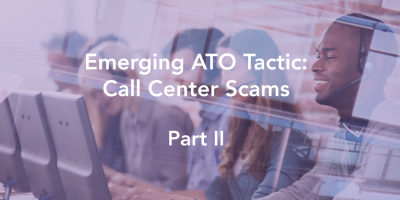 Part 2 of the blog series highlights what financial institutions are currently doing to prevent call center fraud and the downstream problem of ATO fraud, and what’s missing with those solutions. Advances in defensive measures against ATO have led to a change in tactics for fraudsters- many fraudsters are now setting their sights on financial institution call centers to commit ATO fraud. Online digital lenders have proliferated in the last few years, and traditional lenders have also rebalanced their focus and have increased their digital efforts across all products trying to catch up with their nimbler rivals. As a result, the potential target for fraudsters to attack has become significantly larger and more lucrative and they haven’t held back their efforts to inflict maximum financial damage. Fraudsters are constantly coming up with new and innovative ways to commit fraud. Today we are taking a look at product listing fraud, a relatively new type of fraud that is a rapidly growing problem for online marketplaces. A successful spam campaign is one that obtains maximum return-on-investment (ROI) to the spammer. This means that a spam campaign must reach as many end users as possible, must be robust in the face of blacklisting efforts, and must be scalable. This blog post describes some of the recent techniques employed by spammers to distribute malicious URLs on social media platforms as observed by DataVisor. The DataVisor Online Fraud Report took a look at our base of more than one billion users across 172+ countries in the world. Using this massive amount of data, we were able to identify some of the favorite tools and attack techniques that online criminals from around the globe favor when doing their dirty work.